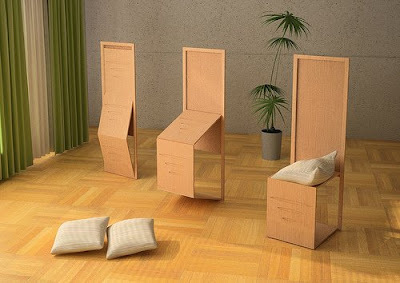 Here we got an interesting piece of furniture 'Biombo Chair' by 24-year old Industrial Designer Daniel Milchtein. 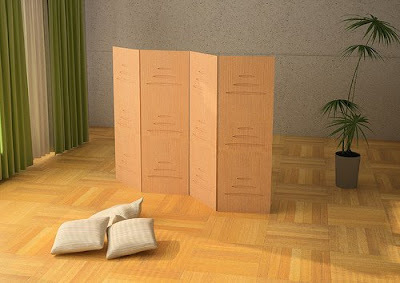 It's a space saving furniture; when not in use it is a folding screen. 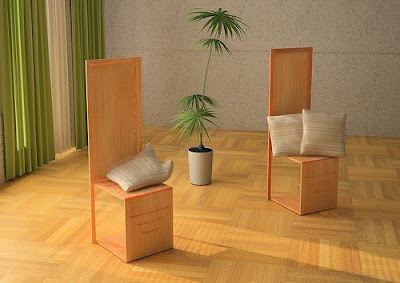 It's a wooden chair, built over a hinged wood structure, and when not in use is a folding screen. The surface of the chair can be engraved with a graphic image that transforms it into a decorative object when folded flat. Can Life Be So Simple. Now Who Wouldn't Like These Houses. Now You Need To Think Of Your Seating Options. Photos With A Realistic Effect. Apple Logo On Apple Tree. Cool Faces In Places - Part 2. Awesome Cat-Friendly House Design - Part 2. Tree Sculptures Of Crawley Library. Sculptures Created With Paper And Toothpicks. Coffee Plus Music With Saucer CD Player. SwiTCh - Table And Chair.